If you've been reading blogs for the past 6 months or so you're probably aware of Makeup Revolution. They've taken the blogging world by storm with a promise of high quality yet affordable products. I'll admit that when reviews started popping up left right and centre I was a little skeptical - could they really be that good? When they offered to send me some of their products to try I couldn't pass up the chance. I received the 32 piece Flawless eyeshadow palette, the Sugar and Spice blush palette, the Focus & Fix eye primer, bronzer and Vivid baked highlighter. I knew pretty much upon opening that the bronzer was a little too orange toned for my complexion, so I passed that on to my mam who loves it. Here's the exciting part though - the palettes. I was not expecting the eyeshadows from the Flawless palette to produce such intense pigmentation with little to no dud shades. In fact, the only shade which lacks a bit is the first one in the palette - Paper. All swatches below were done without primer, but teamed with the Focus & Fix they last on the lids all day with no creasing. 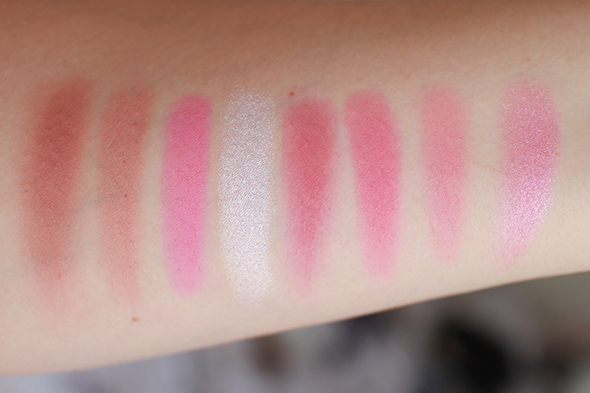 The Sugar & Spice blushers are just as impressive; so much so that you need an incredibly light hand to apply. Consider that your warning - don't delve right in and end up with clown cheeks like I did! They do tend to wear off on me after a few hours though, which would be the palette's only downfall. Finally we have the Vivid baked highlighter in "Peach Lights." For £3 it's a bargain. Although the pattern makes it feel quite rough in the pan, once applied to the cheekbones it creates a lovely glow without creating a disco ball effect. The packaging on this does feel slightly bulky unlike the sleek black palettes. This would be my only gripe as it becomes far less travel friendly. Honestly? Makeup Revolution far surpassed my expectations with these. For those sticking to a budget with makeup you honestly can't go wrong. The Flawless palette retails for £8, while the Sugar and Spice palette comes in at £6. The primer, bronzer and highlighter won't break the bank either at £2.50, £2 & £3. 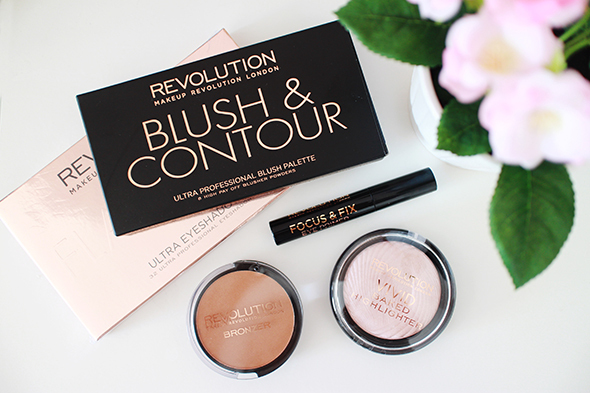 Have you tried any of Makeup Revolution's products yet? The eyeshadow obsessive in me is now lusting after the iconic palettes! I just ordered a bunch of their lip products. I'm so excited!!! The eyeshadow palette is absolutely beautiful! Gorgeous colours. 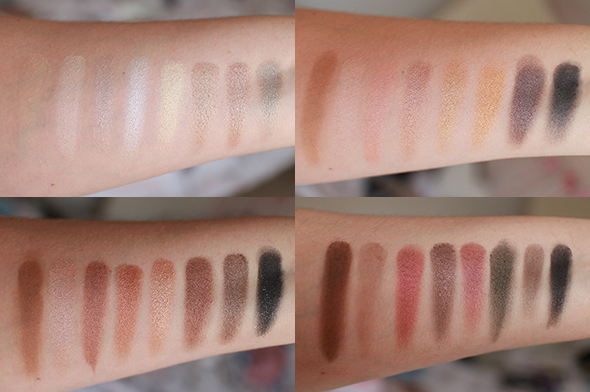 I honestly can't believe these swatches, they are amazing! 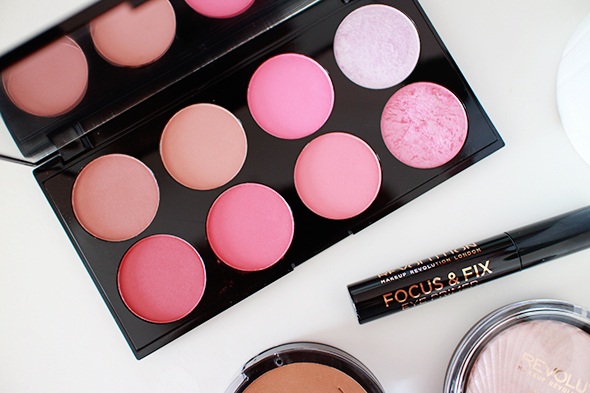 I love the shades in both the eye and blush palette. I just picked up my first lot of Make Up Revolution products and the blush palette was one of them! You're right though they are extremely pigmented! 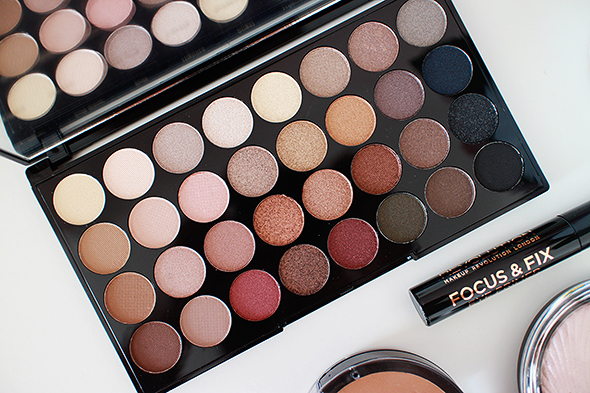 I love Make-up Revolution and I really want to try the Flawless palette. After trying one of their other eyeshadow palettes I'm hooked, such amazing pigmentation! Gorgeous pictures Amy. Such an amazing brand, they have some gorgeous products! Love the look of the eyeshadow palette!